Site: unlimited number of keys for one domain name. Maintenance Contract What is this? Xfrog and MAXON can look back on more than a decade of close cooperation and we value Xfrog as a very reliable and innovative partner. With more than 15,000 CINEMA 4D customers using the Xfrog software, it is one of the most popular commercial 3rd party plugins for CINEMA 4D. Xfrog CINEMA 4D is an Organic 3D modeler which uses procedural definitions of Nature to allow you to create and animate Plants, Nature-based motion graphics, wild organic efx, and all sorts of biomimcry forms/architectures. 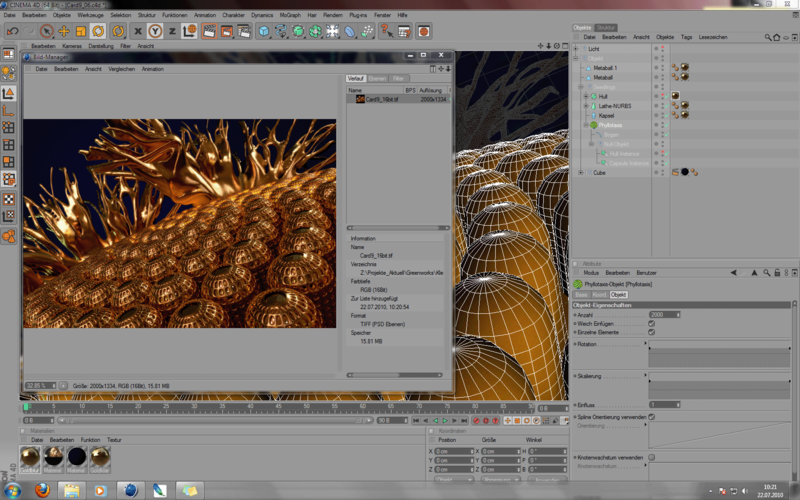 Xfrog enables even the most casual user with extreme new tools to create and animate organics. Since it's release, Xfrog has quickly become the most popular plugin for CINEMA 4D. Some common examples of Xfrog include: tree growth, tree seasons, blossoming flowers, complex nature-based effects, abstract, and many other uses. Xfrog 5.6 has 10% speedup over Xfrog 5.5 and is compatibility with both CINEMA 4D R19 and R18. Xfrog CINEMA 4D adds seven procedural Objects to CINEMA 4D. By combining Xfrog Objects with each other and with any CINEMA 4D Objects, you can quickly create very realistic organic models and animations far beyond the built-in capabilities of CINEMA 4D. 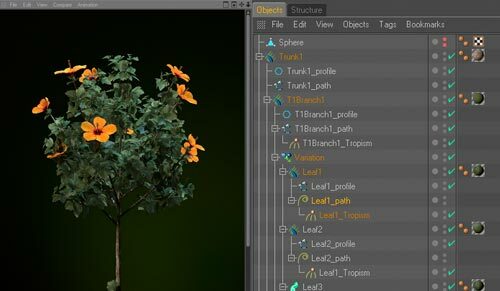 The Branch Object is for easily setting up elaborate multi-level branching structures with numerous parameters to give them a natural look. The Phyllotaxis Object arranges other Objects on an abitrary surface of revolution, according to the rules of nature (golden section). The Hydra Object arranges Objects in a circular pattern. The Curvature Object creates Splines which can be used as a basis for naturally curved leafs or twigs. 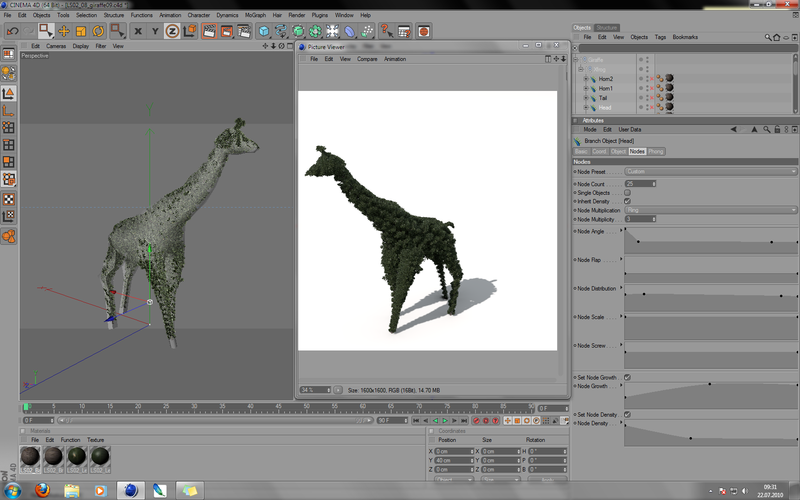 The Variation Object allows you to use multiply different Objects with Branch, Phyllotaxis and Hydra. The Tropism Object lets your spline-based objects (like Branch, but also the CINEMA 4D SweepNURBS) bend towards an abitrary direction or position. The Deviation Object is a simple way to add natural detail to your Branches, by deviating a Branch Object at the places where other Branches emerge. All Xfrog Objects can be animated by varying their parameters: Growth, number of branches, strength of attraction, gravitropism, or phototropism, and each parameter of every Xfrog Object can be animated! 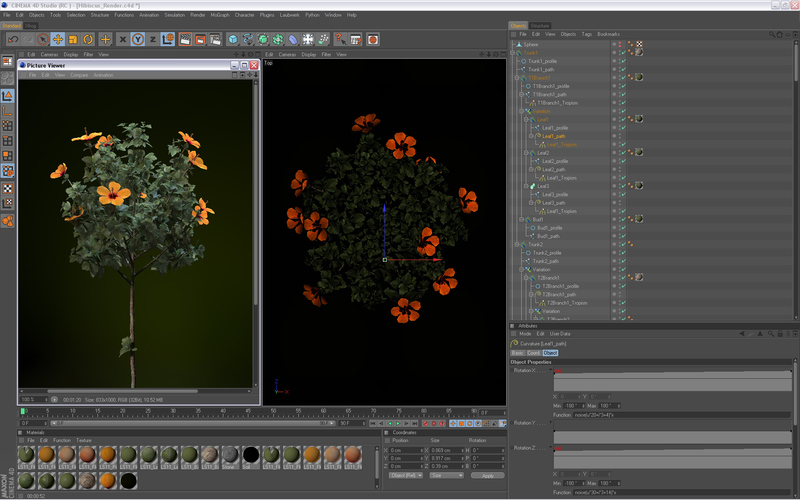 With this flexibility, Xfrog 5.5 for CINEMA 4D can animate things like blossoming flowers or trees growing from seed to adult. 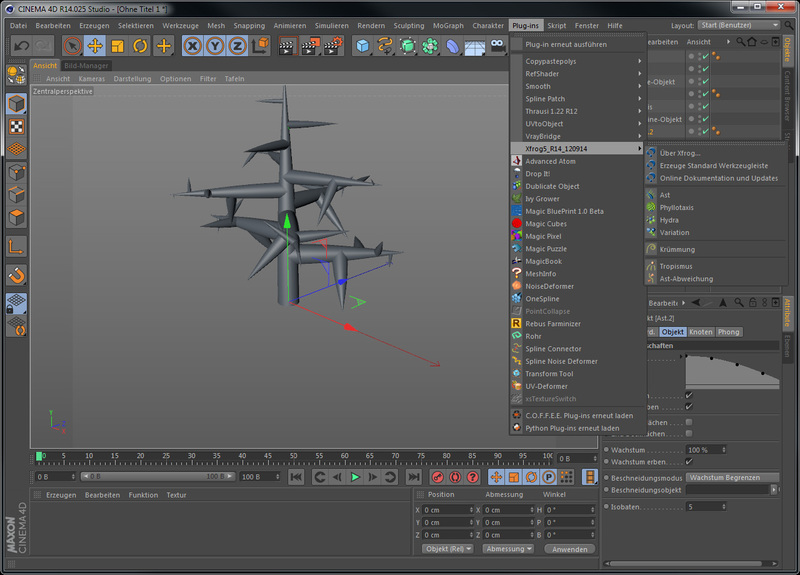 With Xfrog you are adding a formidable procedural organic modeling capabilities to CINEMA 4D. If you currently have a license for Xfrog 5.5 for Cinema 4D R18, you are eligible for a free upgrade to Xfrog 5.6 for Cinema 4D R19. Simply download Xfrog 5.6, install, and request a permanent key. Windows installations require Visual C++ Redistributable for Visual Studio 2015. Mac OS installations reqire Mac OS X 10.9 (Mavericks) or higher. 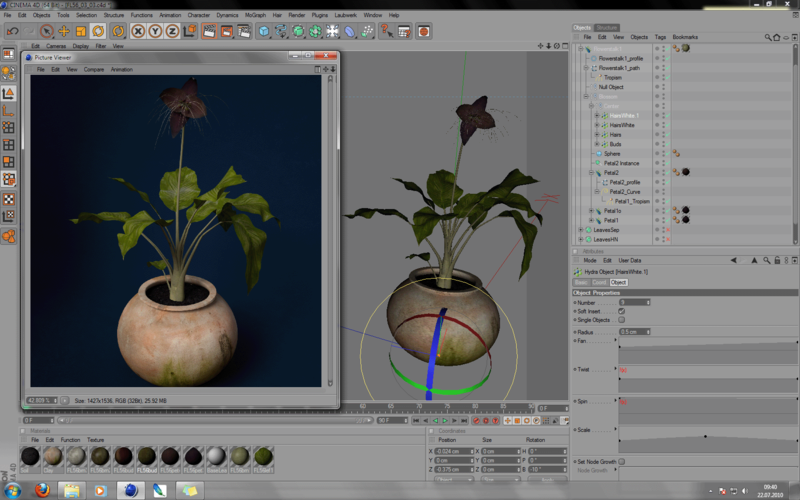 Xfrog CINEMA 4D includes 10 XfrogPlants species, free! Get started with high quality 3d models featuring species of trees from around the world. Each fully textured plant includes variations in age and shape. 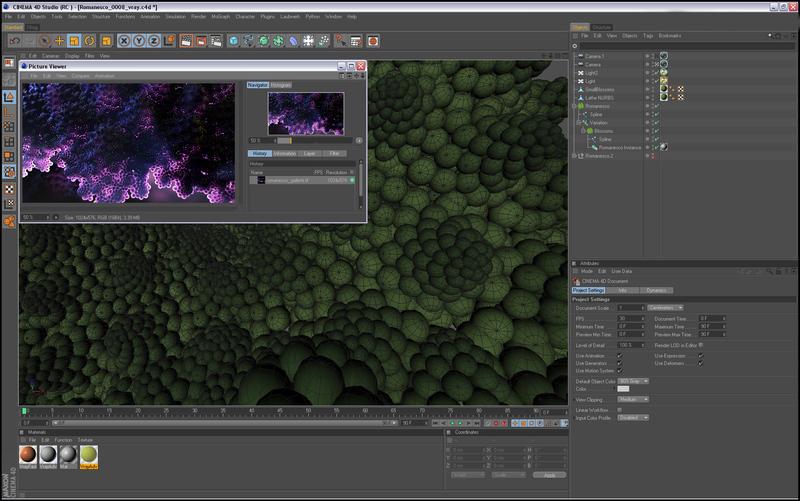 Download a fully functional 30-day trial of Xfrog 5.5 for Cinema 4D here. For help installing and registering your copy of Xfrog CINEMA 4D, visit the Getting Started page in our Support section. Xfrog Software and XfrogPlants are used by major production houses including WETA, Disney Imagineering, Digital Domain, Pixar, Sony Imageworks, ILM, Dreamworks SKG, Electronic Arts, and Sony Entertainment. Many customers purchase XfrogPlants to compliment their Xfrog software. 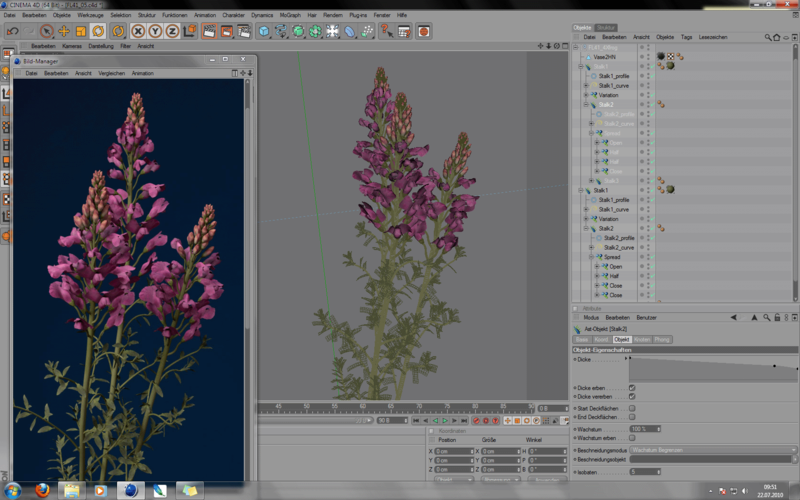 XfrogPlants are realistic, highly detailed, fully textured 3D plant models created with Xfrog software. We have released over 3000 models, downloadable as libraries or as individual plants in C4D, as well as Maya, max, lwo, modo, microstation, Vue, obj, 3ds, and xfr(xfrog) formats. Browse the Xfrog User Gallery or the Xfrog Vimeo Channel. Film Credits: Avatar, The Incredibles, War of the Worlds, Polar Express(every plant), The Time Machine, Blueberry/Renegade and many more films have utilized Xfrog and XfrogPlants. We are very deeply committed to production support. Here you can view some reviews and customer comments regarding Xfrog. Xfrog CINEMA 4D is integrated with DiTools for C4D, and we suggest that you consider the very powerful combination of Xfrog + DiTools, which adds over 30 new Objects to CINEMA 4D for a very low cost. See how Xfrog and DiTools are integrated in this Xfrog + DiTools Video Tour. The Xfrog CINEMA 4D interface is adapted for English, Japanese, French, German, and Italian, and will appear inside CINEMA 4D in the language of your choice.